Seriously Strange Conference: 7-8 September 2019 at University of Bath. Booking here. As part of our work we carry out paranormal investigations and train members to become accredited investigators. If you have a case, such as a haunting, that you want investigated, click here. 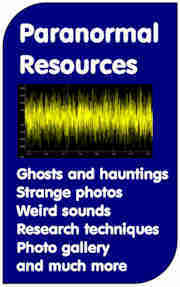 There are also hints and tips on investigating reports of paranormal phenomena here. We also do systematic research, such as looking into possible causes of reports of anomalous phenomena. Some of our previous studies have included paranormal photos (such as ghost photos, orbs (with introduction here) and flying rods), EVP, magnetism and ghosts, haunting sounds and the reliability of witness testimony. An important area of our research effort is looking into how to recognise and eliminate normal causes of paranormal reports. We have found that common causes of paranormal reports include misperception, near sleep experiences and peripheral vision artefacts. We encourage members, and others, to do their own research by giving grants and advice. The ASSAP website has an extensive library of articles including classic cases from our archives, the use of science in paranormal investigation, ghosts (our most extensively researched subject), the use of equipment on investigations and examinations of some of the many subjects we cover. We address popular questions like: am I psychic, have I really seen a ghost and could my house be haunted? We also have stuff for you to do, like trying to 'spot the ghost'. And there's a blog. For more information, try our site map.